All the world’s an agility course? Well, my world is anyway! When I learned that the fourth and final challenge at K9 Kamp was whatever I wanted it to be, I knew I had to slide our real-world agility training into the fun. 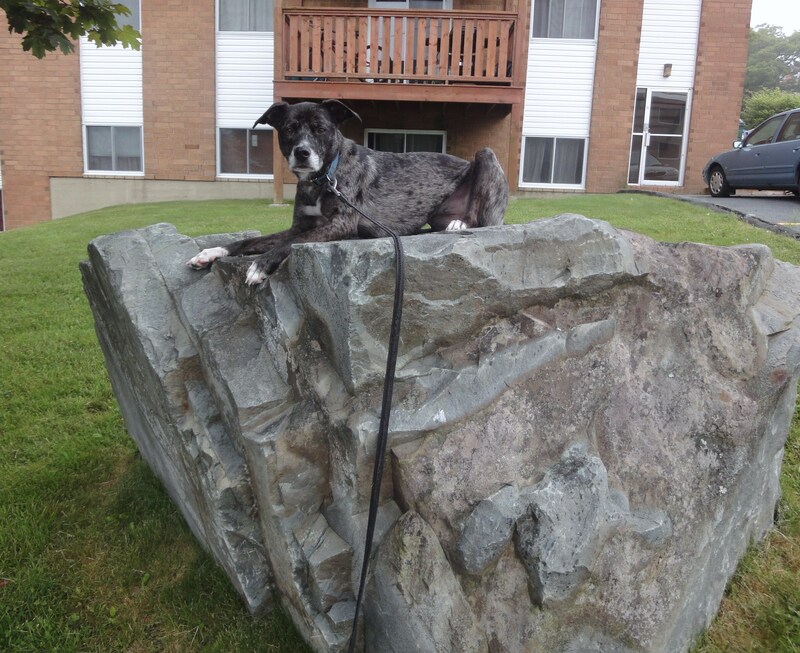 This time it would be with a twist: I would be performing the obstacles alongside my dog! As we have only a small space to work with at home, from the start of our training in dog sports I had to find creative ways to teach Shiva the standard obstacles and work on my handling. 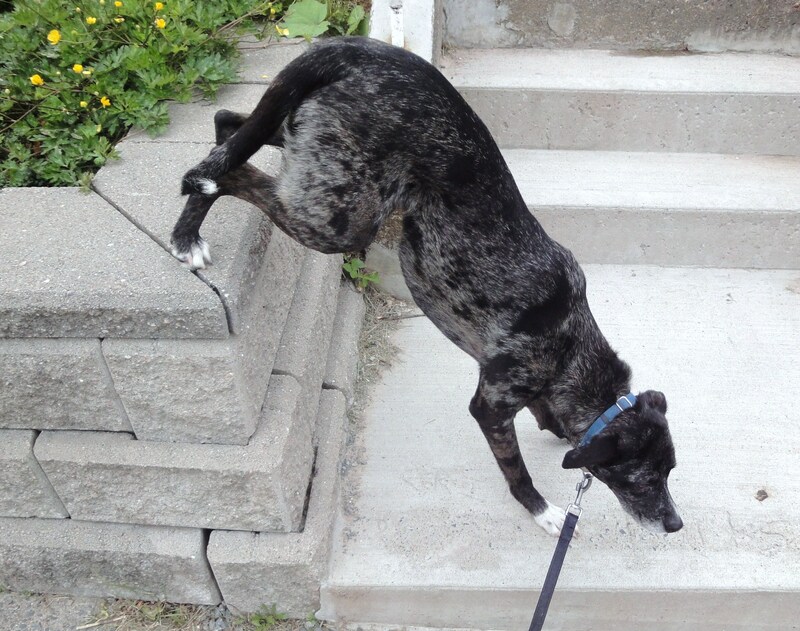 You may be surprised to learn how many agility obstacles can be found on a walk around the neighbourhood. There is no need for expensive equipment when you can find things like rocks, benches, and chain jumps along your daily stroll. 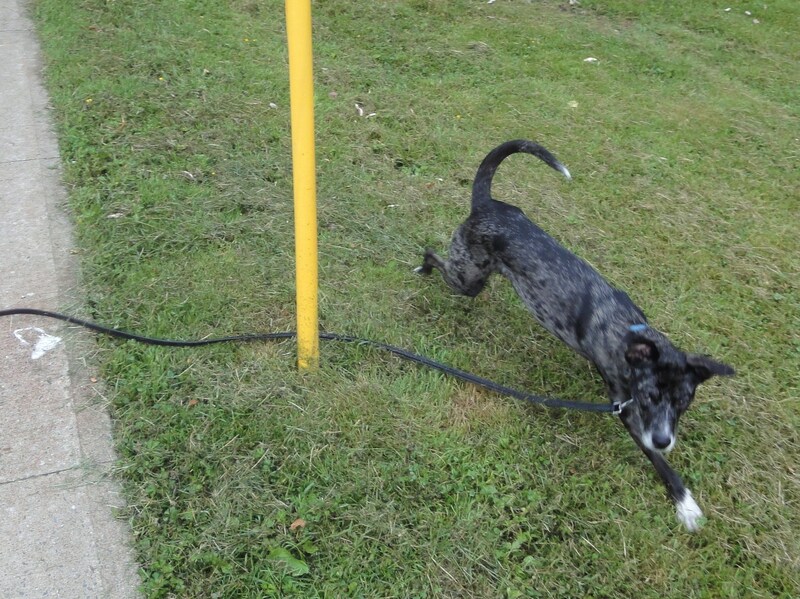 Don’t need jumps to run around when there are poles! Normally I just get Shiva to perform the obstacles while I run along beside her with a reward. This week we did them together! While my two-on-two-off may not be as pretty as hers, I think I did a decent job of staying on my feet. After each real-life obstacle, we dashed off to find the next. It was a great chance to practice her heeling and circle work, as well as a great work-out for my lazy-bone self! The only humiliating part came in when I realized how much better Shiva is at balancing than I. My six-year-old former balance beam champion self is howling in shame. To top it all off, I learned something new this week. Shiva is a pretty tough dog to keep entertained. With a mind that buzzes at hyper-speed it is a challenge retaining her attention. She gets bored pretty quickly and often drifts off to do her own thing (ie. eat garbage). With this K9 Kamp challenge and all the jumping, running, climbing, and two-offing we did, Shiva was forced to look to me for direction. That meant that not only was there 100% less planks this week, there was also at least 50% less mud scarfing! It really shows how a combination of physical and mental activity does the trick to keep a Shiva on task. Too bad it’s also ten times as exhausting for Shiva’s human! Things went slightly better with the cat this week. Which means he did more than just lay there and stare at me. Given it was the last challenge of K9 Kamp, I wanted to go out with a bang and at least have a good time. So we abandoned the stair walking, said sayonara to the ball, and instead played a game he actually enjoys: eating kitty crack. I tried to create a version of kitty push ups, encouraging him to sit and then stand and then sit and then go up on his back legs for the treat. It worked! Sort of. For a minute or so. I’ve learned with the cat, you take what you can get and celebrate even the tiniest of victories. For weeks just isn’t long enough to get anything accomplished with a cat. It took me four years just to get him to stop attacking my leg. At least I got a second picture of him standing! That’s something! Did you do anything new with your pets this week? I’d love to hear all about it! Check out the K9 Kamp Posts from Kol’s Notes and Peggy’s Pet Place and all other participating bloggers! This week’s title is much easier on my Google search terms. Which is a good thing, because the challenge itself wasn’t so easy on my body. It sounds simple, though, doesn’t it? The idea this round was to incorporate fitness with your dog into your daily routine. This is something I am used to doing all the time. With the super speed lives we all lead these days, sometimes this is the only way to get in any fun. Most of our training with Shiva is done in short bursts on the fly, like shaping a new trick while I wait for my flat-iron to heat up, or throwing a ball for her while I type out a blog post. Nice. Since I don’t want to be a wimp, I couldn’t back out. I figured, how hard could it be? I used to take stick warrior classes. Well, okay I took exactly three classes. In university. Over ten years ago. But still! If I lived through those, I can do anything! Yeah. There are no photos of me doing this exercise. Not that it was hard. Not at all! I just don’t want to show off and make anyone feel bad. After all that brilliant fun, Shiva and I braved the low temperatures and took it outside. I found a way to make the stairs less exhausting for me and more enjoyable for her. Instead of just running up and down them together, I tried racing her to the top – giving myself a head start of course. I put her in a sit-stay on the bottom and then took off, only releasing her from her stay when there was a few steps left for me to climb. She still almost beat me every single time but she seemed to like the idea of a chase and I had a blast attempting to compete with her. 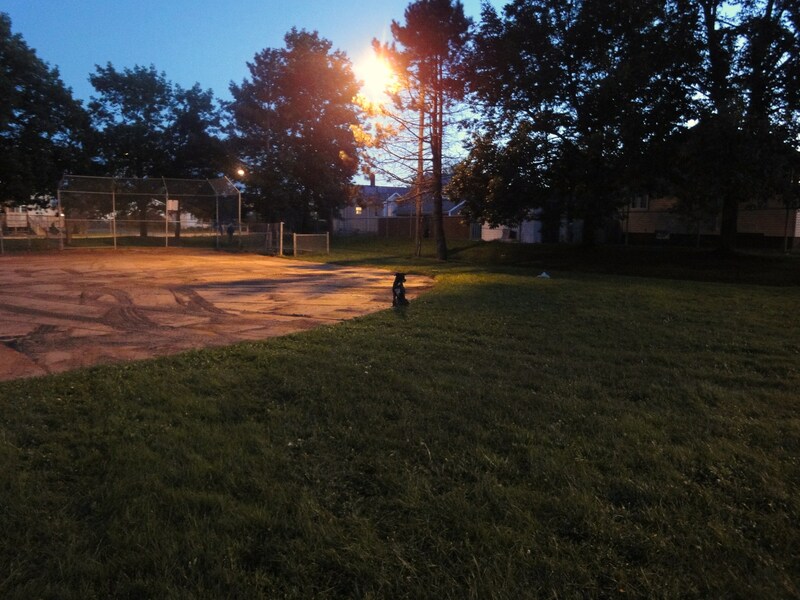 After that we took it to the playground. For whatever reason, we haven’t played around on the equipment for a long time. 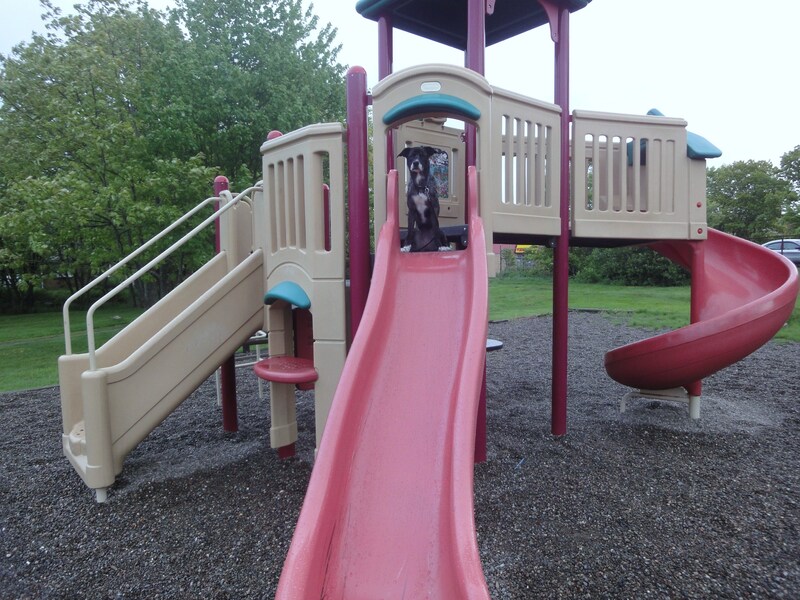 I couldn’t help but giggle out loud as Shiva chased me around the slide and up and over the stairs. 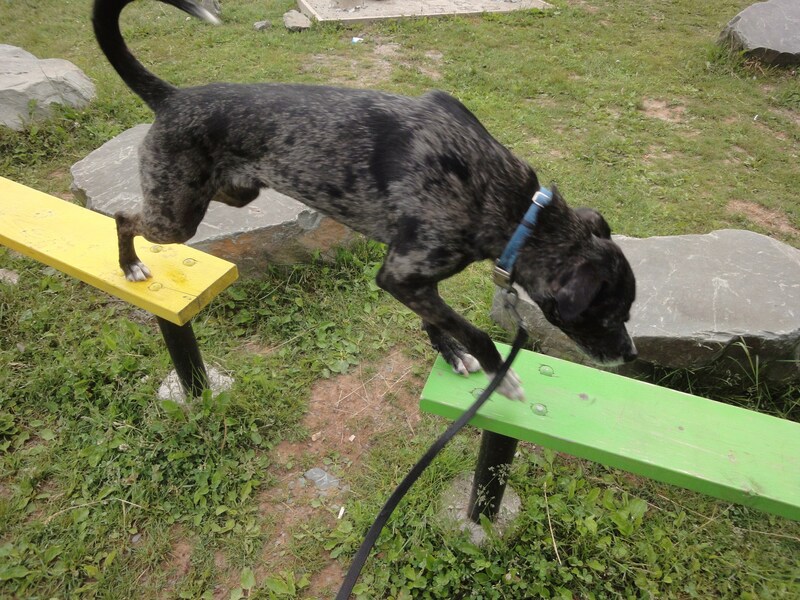 As playgrounds are designed for human children, Shiva isn’t capable of some of the games available, like the monkey bars, but there are many ways they can be adapted for dogs. 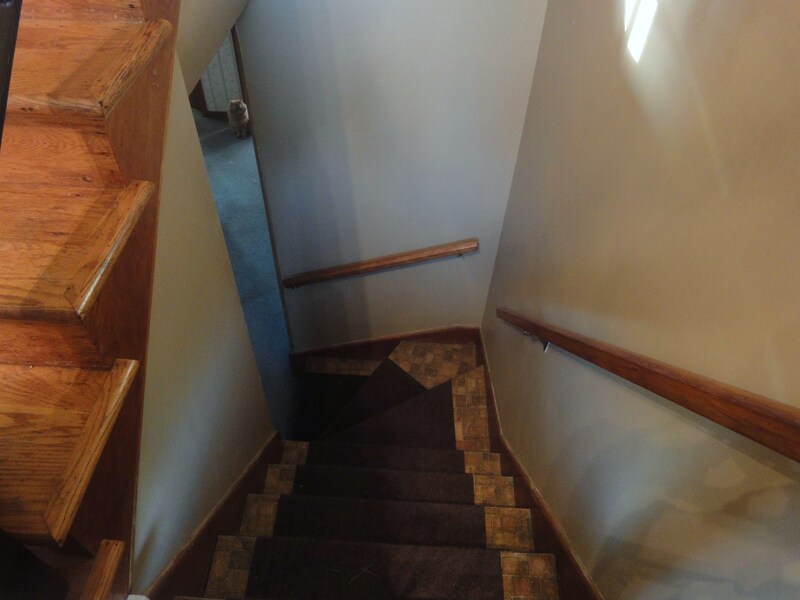 Even just ducking underneath the wooden planks (ugh… planks… evil…) and having quick rounds of hide and go seek with a dog can be a great time. Once all this was done, I didn’t have much energy left for the cat. I worked on getting him to go up the stairs with me a little and tried more of those p-things while rewarding him for doing absolutely nothing. Then I just pulled out the laser pointer and called the challenge complete. Most of my time with the cat is spent in very short bursts as he tolerates my antics for only so long. I try to always end on a high note and leave him wanting more. Basically, when it comes to working with a cat, you have to train when he wants to train, and not when you do. If that is three in the morning, then you take what you can get. It may not seem like you are making a lot of progress but the limited success I have had with the feline one proves that even just a few minutes a day can make a huge difference. It really is true that to win it sometimes all you need is one minute. Did you do anything new with your pets this week? I’d love to here all about it! Check out the K9 Kamp Posts from Kol’s Notes and Peggy’s Pet Place and all other participating bloggers! Disc games definitely qualify as exercise. Not only does Shiva have to run and retrieve, she also has to catch the disc mid-air. Bonus points if she catches it with all four paws off the ground. All that jumping is hard work! The exercise for me comes into play in learning how to throw the disc properly. It’s not an ability I was born with. If I want Shiva to be able to catch it, I need to throw it high enough, close enough, and hopefully in the same direction in which she is running. It’s not easy! More often than not the disc ends up hitting a tree. Or my head. Another game we enjoy is Monkey in the Middle. In this case, “Doggie in the Middle.” We have used balls, discs, tug toys, and even treats. I will stand on one end and my PH will be on the other, with Shiva in between. We throw the toy back and forth between us in the air, doing our best to prevent Shiva from snatching it. It is a great game for encouraging drive for an object. Shiva goes crazy when she sees something flying back and forth in front of her that she can’t have. Keeping her away is a real work-out. 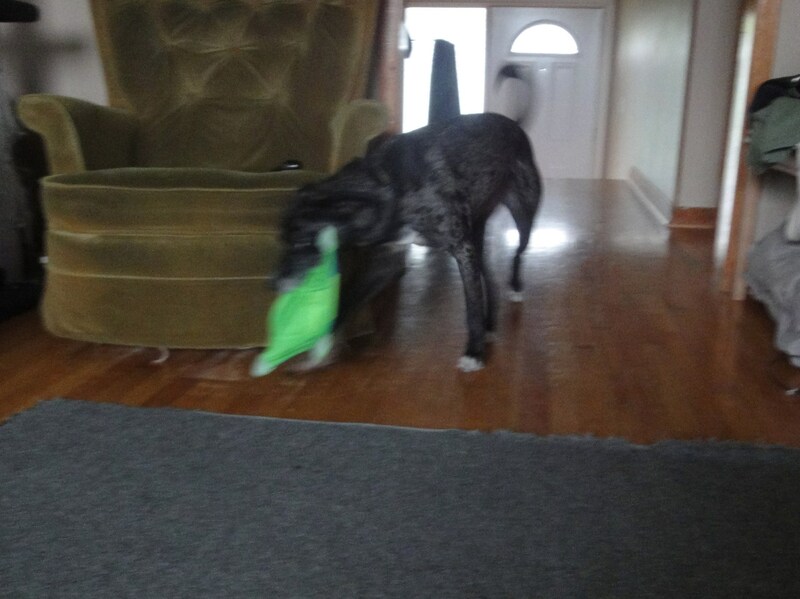 If she does beat us to the toy, we play a quick game of tug and then start all over again. Tragically, we had a lot of fun participating in the challenge outdoors all weekend but when I remembered I needed photos for the blog post, the weather grew cold and rainy. Thus, the only pictures I have of our fun are blurry indoor ones. I need to glue my camera to my forehead or something so I have some better ones of the next challenge. 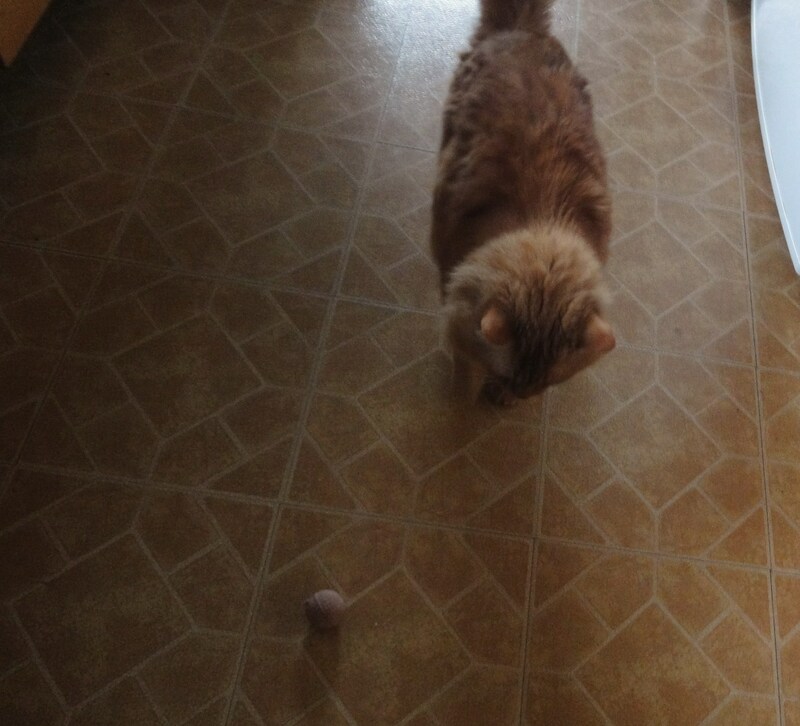 Adapting a ball challenge for The Cat was even more difficult. Believe it or not, he does enjoy playing with such toys, albeit kitty-sized versions, but he is a cat so he usually prefers to play solo. I think the hardest thing about K9 Kamp for cats is finding a way for us to exercise together at the same time. 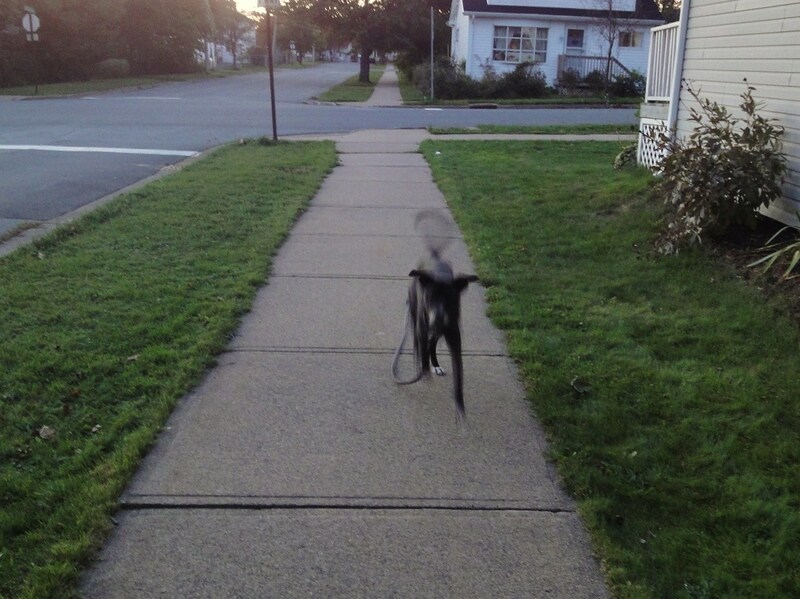 If I move too quickly, he gets freaked out and runs away. It’s like he thinks I am going to jump on him or something. This week, I worked on getting him to bat at the ball when I rolled it near him. I took any movement from him as success. Sometimes I had to be sneaky. I’d roll the ball towards him and then walk away to watch him around the corner. He doesn’t like to play if he thinks it’s what I want him to do. But if I appear completely uninterested, he’ll often come around on his own. In that sense, playing with the cat is the complete opposite of playing with Shiva. 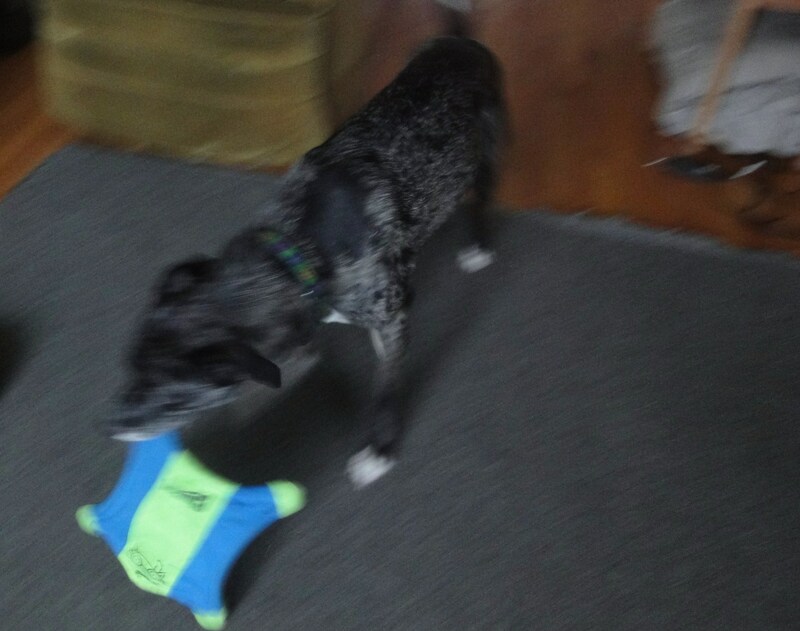 With the dog I have to act like a lunatic, leaping around and acting like the toy is the best thing in the whole world. With the cat, I have to act like a bump on a log. If it wasn’t for the laser pointer (best. cat toy. ever.) I don’t know if I’d ever be able to play with the cat at all. He's standing! 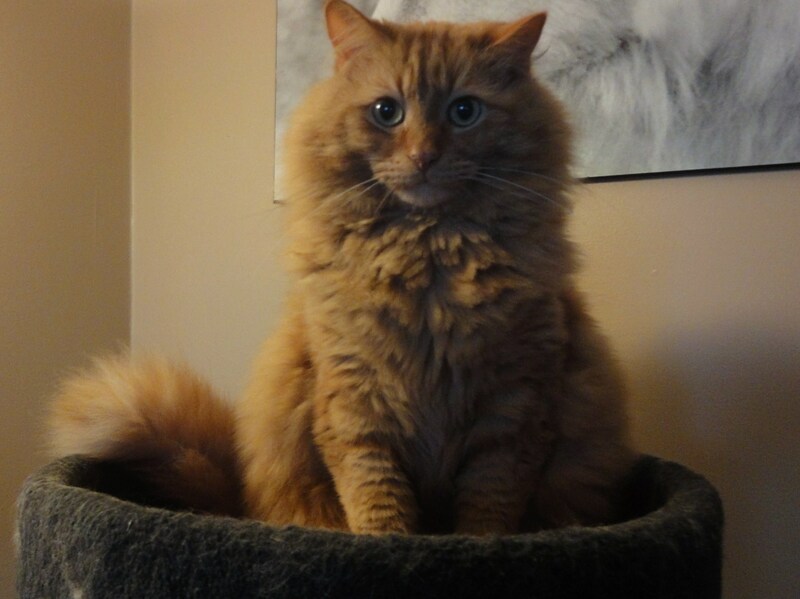 The cat is actually standing in a photo! It's a K9 Kamp miracle! Did you play with your balls this week? I’d love to hear all about it! 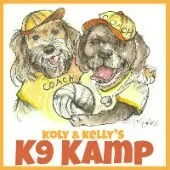 Make sure to check out the K9 Kamp Posts from Kol’s Notes and Peggy’s Pet Place and all other participating bloggers! For this first week of K9 Kamp it almost felt like we were taking the challenge literally. Perhaps all the complaining I did about the rain got through to those in charge of the weather switch? It’s been sun, sun, sun for almost all of the last seven days. Brilliant timing, I’d say. However, due to the Blue Nose Marathon on Sunday, I didn’t participate in this first challenge as enthusiastically as I would have liked. I was trying to take it easy before the race and then after I was too sore to get out and run. Don’t worry. I didn’t completely wimp out. 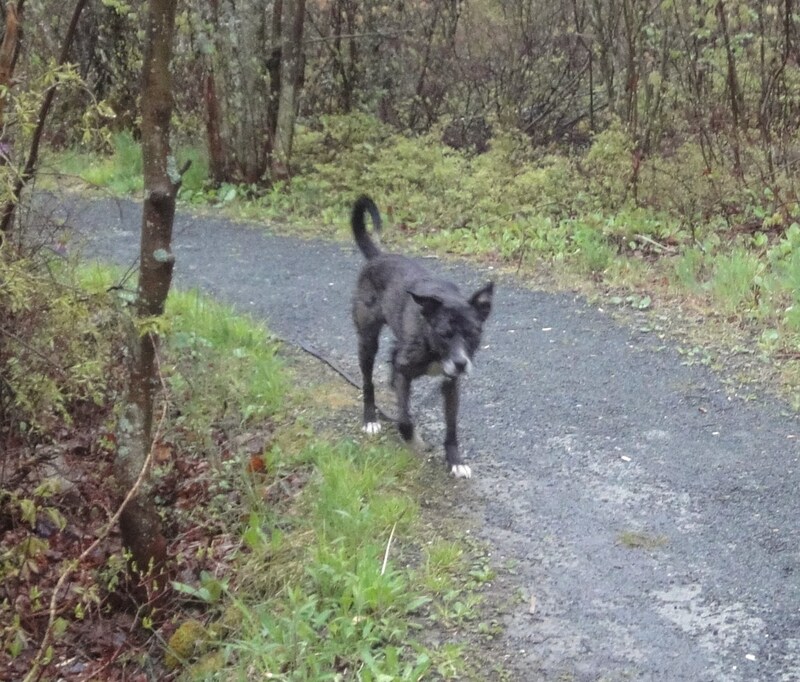 Shiva and I still walked our usual 120 minutes every day. I really didn’t have a choice in that matter. If Shiva doesn’t get at least her minimum exercise requirement every day, she puts holes through the floor with her antlers. Given we are moving soon, we can’t afford to tick off the landlords. I would kinda like our damage deposit back, you know? Yesterday was the first day I felt strong enough to start running with Shiva again. 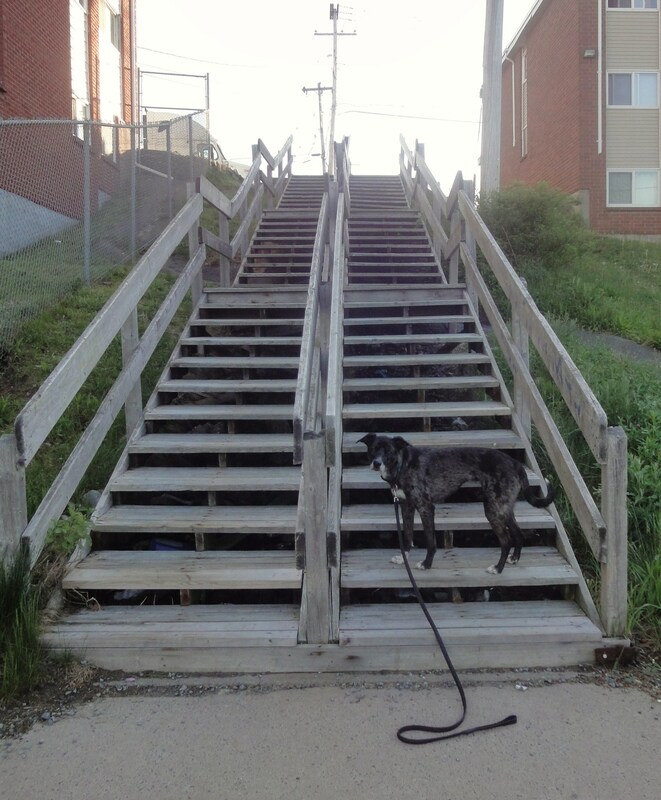 I decided to make it a real “boot” camp and we headed for the stairs! A few times up and down had me sweating and Shiva yawning with boredom. The only panting I got out of her was probably due more to the warm temperatures than the activity itself. If I am going to have a hope of tiring her out I am going to need to start training on my own as well. I already feel like I am working twice as hard as she is, maybe if I double my efforts she will actually start to do some work of her own. Because I gotta say, when I feel like my lungs are going to implode, it’s pretty disheartening to see Shiva nonchalantly chewing on some grass. Training with The Cat was equally frustrating, though for a very different reason: motivation. Since I can’t really take him outside and expect him to acknowledge my existence, I decided to take it indoors. I also knew I wouldn’t be able to get him to do anything without his favourite treats. Though Whiskas Temptations are probably not K9 Kamp-approved, they are the only things for which I’ve been able to get him to work. It’s a trade-off, I guess. 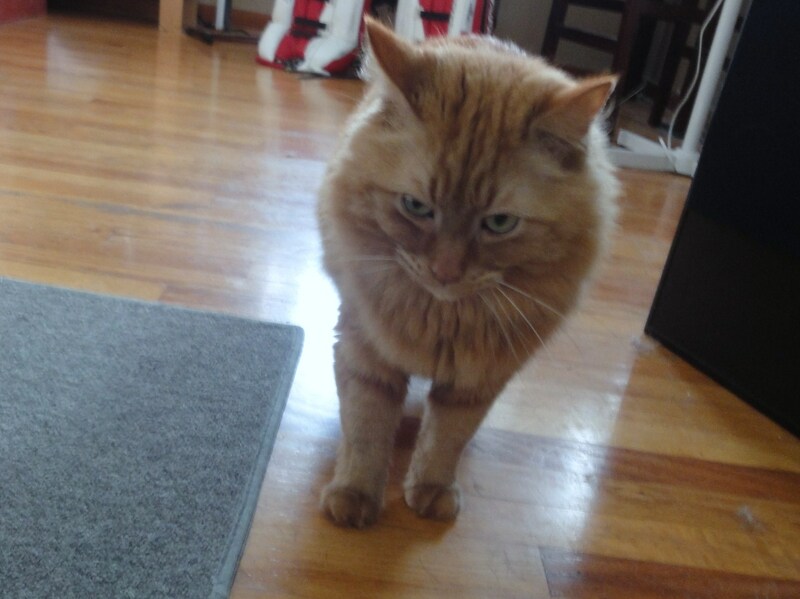 Since the challenge was to walk, I started by encouraging him to walk with me down the hall. I had some decent success. 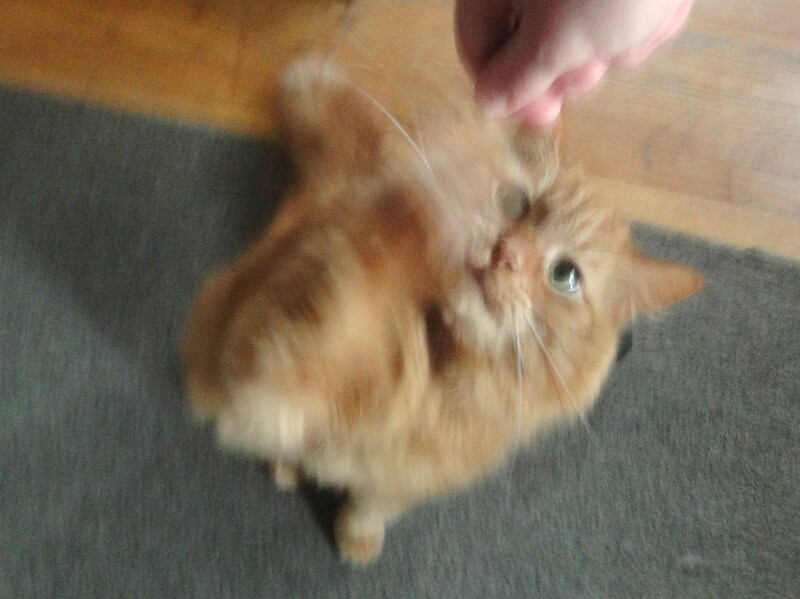 He already targets my finger and will usually follow me if I shake the treat bag. It’s wicked brutal luring but with The Cat I consider it a breakthrough. The going was pretty slow, sadly, and I couldn’t get him to move more than several feet at a time. After every treat he would sit down and stare at me for three minutes, trying to wear out my patience. When I tried to take it to the stairs, kind of like with Shiva, I ran into a major standstill. I got him to go up exactly one step. One. It’s not that he doesn’t run up and down them all the time on his own. 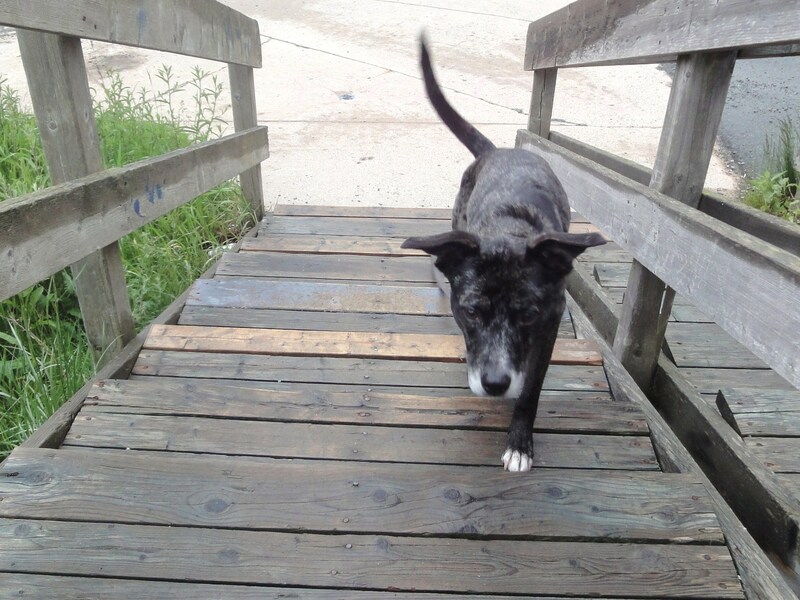 But as soon as I was asking him to go up with me, he decided stairs were the most repugnant things he’d ever seen. After trying to wait him out at the second step, I eventually gave up and just set a single treat on the stair itself and walked away. At least he would be forced to go up that extra step if he wanted his junky titbit. He couldn’t eat it while I was watching, of course. That would be too much like obedience. I almost wonder if he didn’t leave it there for several hours, out of spite. So can I call the first challenge a success? I am not sure. I am also not sure how I am going to get through the next couple of weeks without either injuring either my body or my sanity. It should be interesting. K9 Kamp is Back, Baby! This year is going to be better than ever, I can feel it. 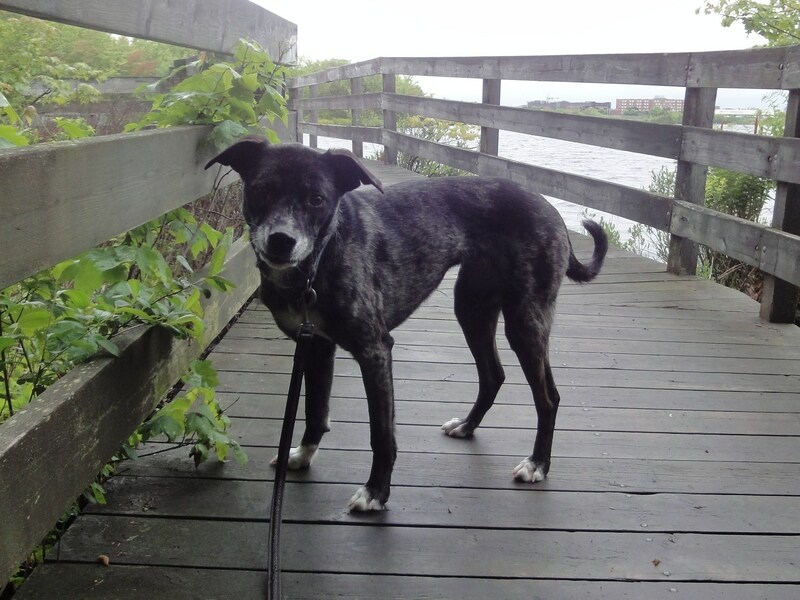 Koly and Kelly have put together some great fitness challenges for bloggers and their animal companions to work on at their own level. It’s all about getting out there with your furry ones and having a good time. Shiva and I had such a blast last year that when I heard they were running a second Kamp, I had to join in. Shiva’s nails are trimmed and ready to go! All I need to do now is pull on my rubber boots and we can get started! Wait a minute, rubber boots? 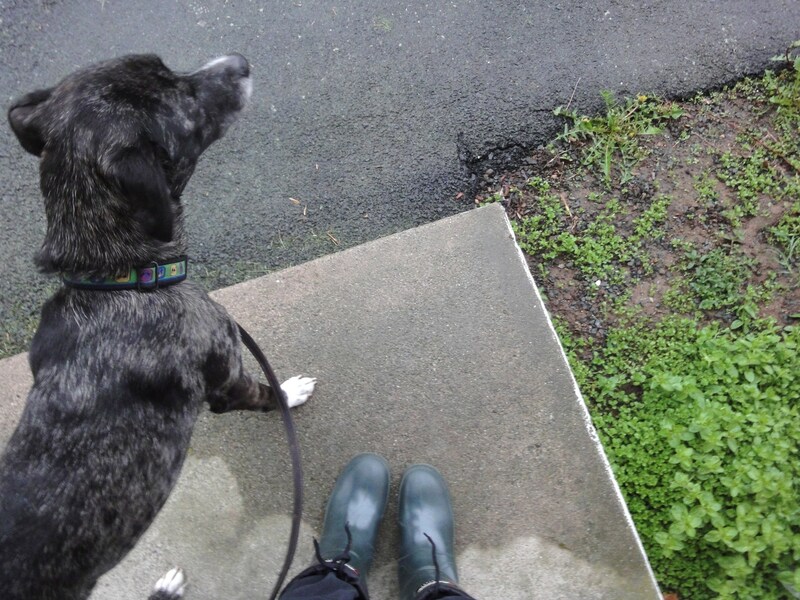 It’s hard to feel a lot of enthusiasm for going outside and getting active with my dog in the pouring rain. K9 Kamp should be just the right nudge I need to brave the Haligonian weather. Besides, the extra weight of boots and waterproof jacket should increase the fitness challenge without me even trying. 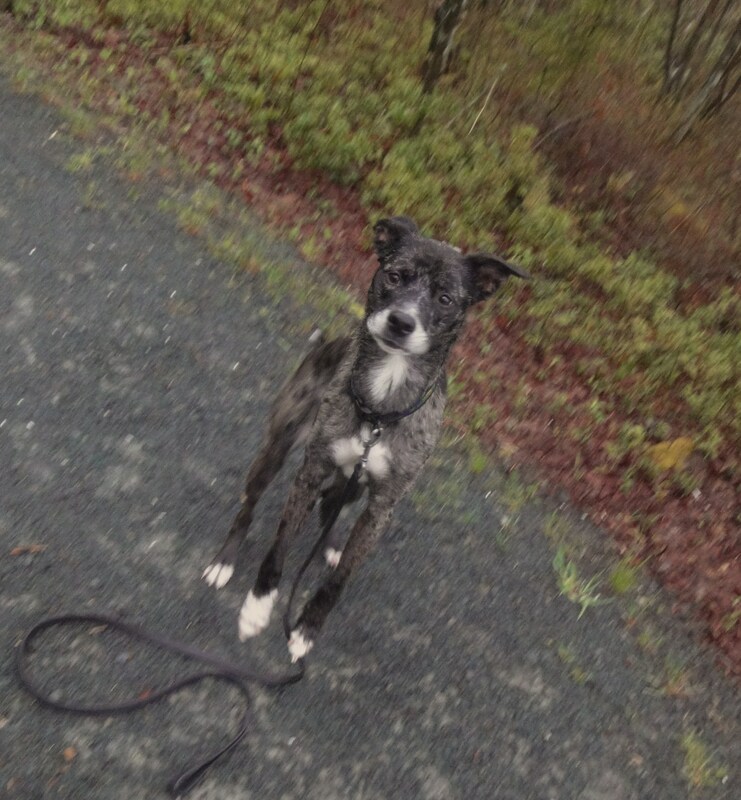 No matter how soggy we get, Shiva and I aren’t going to let a little drizzle keep us indoors. It’s dull to hang around inside all the time and my second reason for joining Kamp encompasses this feeling perfectly. 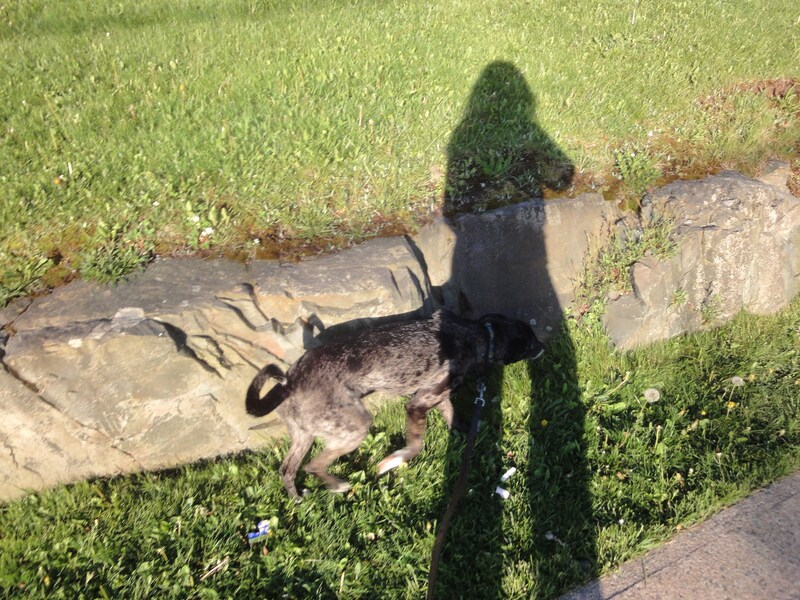 Shiva and I walk a lot. At least six kilometres every day, often more. However, we are deeply entrenched in Ruttsville with no way out. 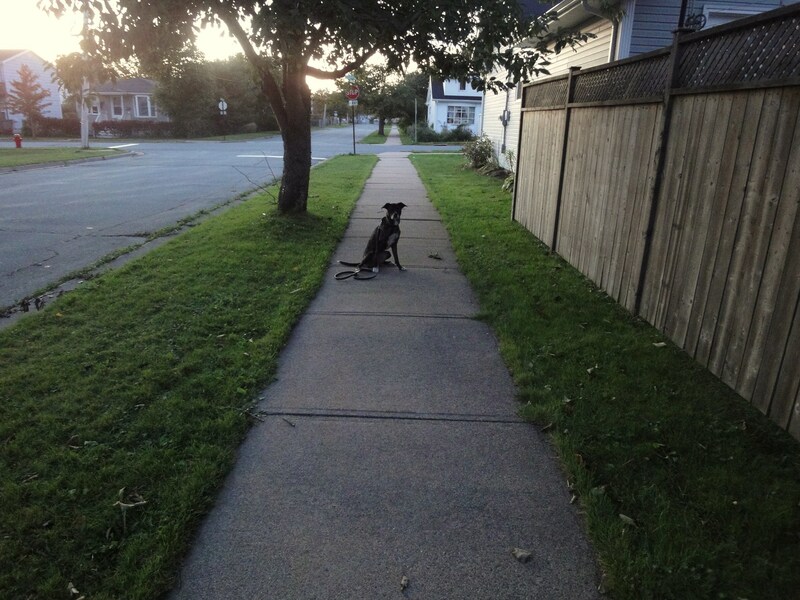 There are only so many ways to tour around residential neighbourhoods and only so many fire hydrants to sniff. Just yesterday Shiva was so bored with our daily routine, she didn’t even muster the energy to scarf more than three pieces of garbage. Not good. K9 Kamp will hopefully add some much needed excitement to our time together. Most of you know I am running in the 5K portion of Halifax’s Blue Nose Marathon this weekend to raise money for the Nova Scotia SPCA. It’s not been an easy journey, especially in the last few weeks. I worry after the race is over on Sunday, I will lose all desire to continue on. I am counting on K9 Kamp to keep pushing me to other races in the future. Which leads me to my fourth reason for Kamping it up. Shiva is one of the fastest agility dogs on the course. If I am ever going to stop humiliating her with my persistent slowness, I need to get in shape. Furthermore, K9 Kamp is all about working as a team with your dog, as is agility. Any activity that brings Shiva and I closer, will make us better competitors in our favourite dog sport. Also, as I mentioned above, I am hoping to participate in other local running events in the future. Due to a recent injury, I will probably end up walking most of the way this time. K9 Kamp will help prepare me for more running with Shiva, which in turn should help prepare me for future races. It may be a little premature, but I am hoping to enter the 10K in next year’s Blue Nose. Wish me luck! And my final reason for joining? That’s right. Cats. I am on a mission to prove cats make just as awesome pets as dogs. When I found out K9 Kamp was open to all animal friends I knew I had to get our cat involved this time as well. It’s going to be a challenge as he generally prefers to exercise on his own time, but if I can get him to spin for treats, I feel confident I can get him to walk beside me. Maybe even on a leash? There is still plenty of time to sign up and join in! Even if you don’t think you can fit in all of the challenges, I encourage you to participate in your own way, such as walking your dog for an extra ten minutes, or playing fetch at a different park. 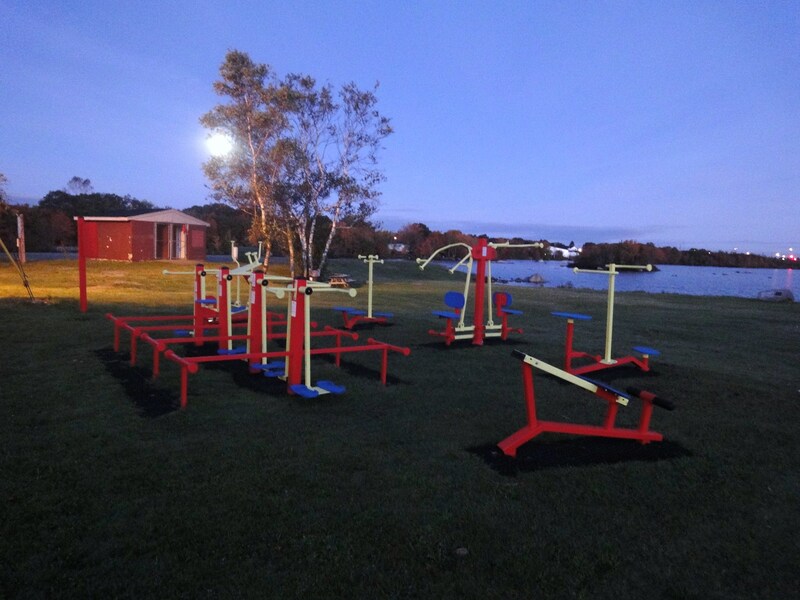 Everyone can get into the K9 Kamp spirit, no matter what your fitness level! Don’t forget, there are some pretty wicked prizes to reward you for your efforts. Do you plan on joining K9 Kamp this year? What activities do you and your pets most enjoy together?